THIS! A thousand time THIS! This is how you respond to leftists who want to censor speech! An Australian Senator sent this message to a constituent who had informed him that Australia’s multicultural laws made it illegal to do things such as publish cartoons of Mohammed on the internet. There is no reason to engage with these people who would like to have a veto over what we say. There is no reason to treat with them, or negotiate. 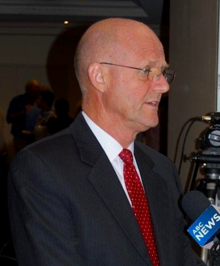 The world is in desperate need of more men like David Leyonhjelm and we salute him! Reporter: What are you doing David? David: Oh the usual, just whipping up some more verbal Viagra to stiffen the… um spine… of a free world desperately in need of something other than the limp, unprincipled, ineffective, afraid to give offense leadershit it has suffered under for far, far too long. Reporter: Could you boil that down to a soundbite for me?